We are now on Facebook! Visit our page by clicking on the above image. Enjoy! Thanks to Charlotte Jibben for creating and maintaining our Facebook page! The Tazewell County Genealogical & Historical Society (TCGHS) library is located in the Ehrlicher Research Center at the above address. The library is open Monday 9 am-1 pm, Tuesday 9 am-1 pm & 7-9 pm, Wednesdays 9 am-4:30 pm, Thursday-Friday 9 am-1 pm, and Sundays 2-4:30 pm central standard time (closed on holidays and holiday weekends). The library is staffed with one or more trained volunteer genealogists. Since we do depend on volunteers, unexpected closings can occur but are very rare. If you are coming through town and can't stop by during our normal hours, email us and we'll try to make arrangements to meet you at the library. Bob Hoffer will discuss the life of John Dusenberry, a revolutionary war soldier who served in the Third regiment, enlisting in January 1776. He was a first Lieutenant and then Captain of his company. Lt. Dusenberry served in Washington’s armies at the battles of Long Island under Lord Sterling, the retreat from New York, Harlem Heights, White Plains, Trenton, and Fort Independence. He served for two years under Lafayette. He was wounded at the battle of White Plains, but continued to serve until March 1778. He came to Peoria, Illinois from Sterling, New York in the early 1830s. John Dusenberry died in Peoria on September 25, 1833. He was buried in the “Old French Cemetery” which became Block 35 when the Town of Peoria was formed in 1835. A marker stands on the corner of that long-abandoned burying ground. Start saving items to donate for our annual rummage sale—please no TV's, computers, or clothing! Hardback & paperback books are especially welcome! The sale will be held at our library on Friday, May 31, 2019 - 8am - 5pm and Saturday, June 1, 2019 - 8am - Noon. You can drop off donations starting Wednesday, April 10th, through Wednesday, May 29th, during library hours. All proceeds go to further the society's collection. At the end of the sale, we always donate any remaining items to other local organizations. TCGHS becomes a FamilySearch Affiliate Library! Tazewell County Genealogical & Historical Society is pleased to announce that we are now a FamilySearch Affiliate Library! Visitors to our library now have free access to many millions of additional digital images on the FamilySearch website than they can access from home. Here's the details! Our Tazewell County Deed Collection contains original deeds, titles, and mortgages from 1830-1929. This information has been recorded at the Tazewell County Recorder’s Office. However, the collection does not contain all records for this time frame. Check out the Deed Collection page for additional information on the collection, index lookups, and/or document copies. Tazewell County Genealogical & Historical Society (TCGHS) compiled this new index using the original returned marriage licenses which were in storage at the Tazewell County courthouse. Each entry in the index contains Record Number, Bride & Grooms names, Date of Marriage, Surnames of Groom's mother, Surname of Bride's mother, and any other Surnames mentioned. This new index is available for purchase or may be consulted at our library. TCGHS is not responsible for any mistakes made in this index. Many of the names were originally recorded in very hard to read handwriting – so the transcribers sometimes had a difficult time deciphering them. Researchers should check any possible spelling variations when searching for a license. Researchers may also order copies of the licenses. Images of 1898-1950 Marriage Licenses are now available! TCGHS has scanned the original returned 1898-1950 marriage licenses which were in storage at the Tazewell County courthouse. Copies of these original license images can be ordered for $5 each. Some of the licenses had extra papers dealing with the marriage – usually permission signed by the parents or guardians for underage children to marry. Copies of these additional papers will be included with the license at no additional charge. Orders may be placed at the Society's library, through the mail, or online. Do you shop at Kroger?? Were you aware that you can ask Kroger to make a small donation whenever you check-out using your Kroger Plus Card? Sign up now and help TCGHS out whenever you shop at Kroger. Think about TCGHS when you shop online! If you ever shop online, please keep in mind that many online merchants will donate a portion of your purchase to TCGHS. You'll still get the same great prices and service you would get by going directly to any of these merchants. Over the years, the society has received several hundred dollars in donations this way. and select any of over 1,700 major merchants including names such as the Apple Store, Bass Pro Shops, Best Buy, Dell, Eddie Bauer, JC Pennys, K-mart, Kohls, Lands End, most hotel chains, most travel websites, Nordstrom, Pottery Barn, Sears, Staples - even Walgreens & Walmart. You'll get the same great prices and service you would get by going directly to any of these online merchants. So, whether you are buying big items such as a new computer, small items like an ink cartridge, or any item online, check Amazon and Igive out first. Despite the valiant efforts of many folks (including our society) to save the historic landmark building, the 98 year-old Pekin Community High School West Campus sadly succumbed to the wrecking ball. As a memento to remember the building, the society has created a souvenir shelf sitter depicting the front of the West Campus. This is a high quality keepsake which will capture your cherished memories of West Campus. Here's more details and how to order your copy before they are gone! Commemorate your support by sponsoring a leaf for your family on our surname tree or a tile for your company on our Tazewell County Business Plaque! You can also contribute by purchasing one of the historic shelf sitter buildings. Become one of the almost 400 members of the Tazewell County Genealogical & Historical Society. Or renew your current membership! Here's what the Tazewell County Genealogical & Historical Society stands for. We moved into our new facility in 1997. See more photos of our library and check out some of our holdings. Do you know of a group, no matter what age, who would like a tour of our library - whether it be a grade school class, church group, or civic organization? If so, give us a call or send us an email to schedule a convenient time for a tour. The Tazewell County Genealogical & Historical Society board consists of the elected officers, four elected at-large board members, and the immediate past president. Here's a list of our current officers and committee chairs. The Monthly now available electronically! The Monthly is now available for home delivery in pdf format via e-mail. Tazewell County Genealogical & Historical Society members have always received a monthly print newsletter called The Monthly as one of the benefits of their membership. The Monthly is filled with Tazewell County historical and genealogical articles, documents, and pictures as well as information on Society special events, monthly meetings, and projects. Members may now elect to receive their newsletter either through the postal mail service or electronically via e-mail. Do you have a direct ancestor who was an early (prior to 1875) Tazewell County settler? If so, apply for our Pioneer Certificate. It will become a proud addition to your home! (see sample). So far, we've issued certificates for these Tazewell County Pioneers. Updated January 2019. TCGHS has created a series of four different collectable shelf sitters representing historic Tazewell County buildings regularly visited by Abraham Lincoln in the late 1840s through 1860. Collect all four - the Tazewell County Courthouse, the Jones-Menard "Red Brick" House, the Lilly Inn, and the Tazewell House! Here's more info including photos! Tazewell County Surname Registry - Free! Here's a list of folks who are researching various Tazewell County surnames and who would like to correspond via email with other researchers. Register the surnames you're researching now -- all we ask is you limit your entries to surnames which have a connection to Tazewell County. Last Updated March 2019. Introduction to Tazewell County Vital Records - Free! My ancestor was born in 1825 - can I get his birth certificate? Where can I get a copy of a death certificate? These questions and more are answered in our overview of Tazewell County Vital Records. Tazewell County Cemeteries - Free! Here's a list of all known cemeteries in Tazewell County, including the township and section they are located in. Some cemeteries have links to additional information such as cemetery history, location maps, driving instructions, and photos. Tazewell County Township Map - Free! Here's a map of Tazewell County showing the township names and locations. Historical Tazewell County Maps - Free! Here are historical maps of Tazewell County covering 1833, 1857, 1873, 1896, 1920, and 1929. Ortssippenbücher (OSB) Collection - Free! Many of the early settlers of Tazewell County emigrated from a region of northeast Germany known as Ostfriesland (East Friesland or East Fresia). Ortssippenbücher (OSB) books contain important information for Ostfriesen researchers such as names, occupations, family relationships, and dates of births, marriages, and deaths for families from a specific Ostfriesen town or village. The information (usually extracted from local church records) is presented alphabetically by family group surname. Our collection of OSB books is thought to be the largest in the State of Illinois. List last updated January 2019. Amish Mennonites in Tazewell County, Illinois (including Woodford County) - Free! Joseph Peter Staker has written a thoroughly documented extensive history of 91 Amish Mennonite families who immigrated to Tazewell (and surrounding) Counties before 1856 - over 1250 pages with around 1600 source citations. Joe has graciously placed his four volume book on our website as Adobe Acrobat searchable PDF files which you can download for free! Last updated in December 2018. Researched surnames include Abersoll, Ackerman, Augsburger, Bachman/Baughman, Beck, Beckler, Beller, Belsley, Birky/Birkey, Boshart, Brenneman, Brickler, Camp, Chlopicki, De Guibert, Dellenbach, Dettweiler, Donner, Egli , Ehresman, Eigsti, Eiman, Engel, Ernst, Esch/Oesch, Farny, Gascho, Gerber/Garber, Gingerich, Goldsmith, Good, Grubb, Habecker, Hauter, Heiser, Hochstetter, Householder, Jantzi, Imhoff, Kauffman, Kennel, King, Kinsinger, Kistler, Klopfenstein, Lantz, Leman, Litwiller, Martin, Maurer, Miller, Mosiman, Nafziger, Naffziger, Neuhauser, Orendorff, Oyer, Petersmith, Plank, Ramseyer, Rediger, Reeser/Risser, Reust, Rich, Ringenberger, Roeschley, Roggy, Ropp, Roth, Ruvenacht, Salzman, Schantz, Schertz, Schlegel, Schrock, Schwarzentraub, Schweizer, Sharp, Smith, Sommer, Springer, Staker, Stalter, Steider, Steinman, Strubhar, Sutter, Ulrich, Unzicker, Vercler, Von Diesbach, Wagler, Wagner, Yoder, Yordy, Zehr, Zimmerman, Zook, and Zwalter. Member Werner Gertberg of Moosburg, Germany has written an extensive family history, fully titled About the DULLY family in Central Europe and USA - Ancestors, Descendants, and Relatives of Anna Maria Eva DULLY, living 1797-1855 in Palatinate. Werner has graciously placed his 454 page 29.4 MB book on our website as a searchable Adobe Acrobat PDF file you can download for free. Last updated in January 2019. This work deals mainly with Anna Maria Eva DULLY and four generations of her descendants, including parts of five generations of USA relatives. 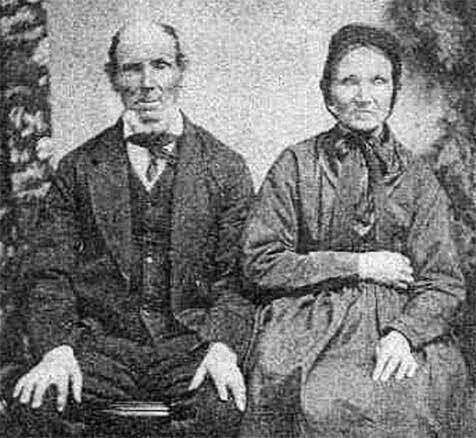 It was written in remembrance of the arrival of Christian DULLY (Anna Maria's son) & Katharina FRÖHLICH on 16 April 1867 at New York, 150 years ago—the couple's photo at left was taken about 1890 in Tazewell County. Researched surnames include Allen, Ammerman, Andrews, Appell, Badorek, Baker, Bandy, Bartlett, Baumann, Bebout, Benedict, Bennett, Birky, Bledsoe, Blessman, Blevins, Bole, Bolwar, Bossert, Braucht, Brecher, Bridgeman, Bright, Brown, Bullock, Burch, Cadwel, Carrington, Caton, Childers, Clark, Clements, Click, Close, Collins, Cook, Cooper, Cordts, Couch, Crager, Crane, Crawford, Crisman, Christ, Crotts, Cunningham Dagit, Davis, Devore, Dickie, Dietrich, Duffie, Duley, Dully, Edworthy, Eichelberger, Felker, Foster, Frampton, Fritts, Fröhlich, Froehlich, Fulkerson, Furnish, Gardner, Garner, Garrett, Garrison, Gathmann, Gearen, Gerber, Gilbert, Gohde, Gowan, Gunterman, Haas, Hancock, Hanna, Hartman, Heilman, Hirst, Hodge, Hodgson, Hoerr, Holmes, Houser, Hoyt, Huber, Hunt, Hurst, Jarrell, Jenkins, Johns, Jones, Kady, Keller, Ketchum, Klein, Koch, Krahn, Krug, Lacock, Lamb, Lawrence, Layne, Layten, Leininger, Lewis, Livengood, Lobbs, Lohnes, Loper, Lumbert, Macha, Maple, Marshall, Mcbridge, Mekan, Meny, Miller, Mitchell, Montgomery, Morrison, Morsch, Mularoni, Nelson, Newlund, Nieukirk, Nievar, Norman, Obeldobel, Olsen, Pangborn, Perry, Pfeifer, Pfeiffer, Pferdsdorf, Pinos, Polen, Pollman(N), Pollock, Potts, Purdy, Rainey, Rapp, Redlingshafer, Redlingshöfer, Reuling, Reissel, Richardson, Ritthaler, Rowan, Rucker, Ruff, Rumsey, Sanders, Schaefer, Schaffer, Scheidel, Schmidt, Schock, Schoonover, Schrenk, Schwinn, Serpette, Shanbeck, Shaw, Shipley, Slavin, Sommers, Spencer, Spotts, Sprague, Springer, Springer, Stark, Stauthammer, Stephens, Stevens, Stickles, Stormer, Stouthammer, Swigart, Taylor, Tennell, Tharp, Thielbar, Thomas, Thomlinson, Tuffentsamer, Tunis, Van Petten, Vandyke, Volk, Wageman(N), Waldbeser, Walker, Warner, Webster, Welch, Wilfawn, Williams, Wills, Wineburner, Wright, Wubben, Young, and Zimmerman(N). Tazewell County Education Records - Free! Joy Wojtas, Certification Specialist - Tazewell County Regional Office of Education, discusses school records dating from 1911 through 1962 which may be of assistance for research purposes. During the past one hundred years, many changes have taken place in education. The maintaining of various records gives future generations some insight into what was happening during a particular period of time. Newspapers on Microfilm - Free! Here's a list of the Tazewell County Newspapers prior to 1953 we currently have in our microfilm collection. Here's a list of some websites, family histories, and mailing lists you might find helpful doing your Tazewell County research. Last updated January 2019. Tazewell County records transcribed, indexed, and published by the Tazewell County Genealogical & Historical Society. Classic research materials such as searchable county histories and atlases (CD-ROM) cemetery listings, marriage records, land records, naturalization records, census records, atlases, and directories. We've recently added several items including previews of our historical postcards. And, we now have an online shopping cart for your convenience! Our society can provide research services to those unable to visit our library such as surname & property searches of the TCGHS library holdings, obituary searches at Pekin Public Library, searches of Tazewell County courthouse records (birth, death, marriage, & probate), and photographs of your ancestor's grave. Tazewell County Notable Men Photographs now available! Our archivists were recently given access to over 1500 5"x7" photos taken by 19th century photographer H.H. Cole. These photos have been stored in the basement of the Tazewell County Courthouse for decades. Most of these photographs are of early Tazewell County settlers. We have scanned the collection and the images are now available to researchers. Check our list for your ancestors. Tazewell County WWI Soldier Photographs now available! Included in the society's L. Sidney Eslinger Glass Negative Collection are over 100 glass plate negatives of identified area soldiers in uniform, probably from around the time of World War I. There are many, many more unnamed ones. These photographs were taken by H. H. Cole, the well-known Tazewell County photographer. Our archivists have scanned the collection and the images are now available to researchers. Check our list for your ancestors. A few years ago our society became aware students at Dirksen Primary School in Pekin had no idea who Senator Everett Dirksen (the school's namesake) was or what he had done during his public service. Since there were no books documenting the Senator's life available at an elementary reading level, a committee was created to research and write a biography for elementary students. Copies of the books were presented to the Dirksen Primary students. Although written for a third through seventh grade reading level, the book presents many facts and photos of the Senator's life that adults would also find interesting. Here's more information on the creation of the book and how to get a copy. Tazewell County Veterans of World War II Remembrances! On Sale! $30 shippled! Pick up at the Library for only $25! The Society collected oral & written histories, documents, and photos from over 450 Tazewell County WWII veterans in order to preserve their stories for future generations. These memories have been published in an approximately 500 page 8.5" x 11" book entitled Tazewell County Veterans of World War II Remembrances. As you can see, the book has a high quality, long-lasting library binding. Pictures of most of the veterans have been included with their stories. This is a unique opportunity to relive how these “ordinary” men and women made amazing sacrifices during those extraordinary times, forging the values that made our people and nation great! This book would make a gift that will be cherished for generations to come! Follow this link for more details and to get your copy today! One of our members, Jim Conover, has co-authored the definitive book on the history of "the Berry Gang", who terrorized the people of Tazewell County for years during the late 1860s, despite the efforts of Pekin’s tough City Marshal Alfred Stone, Tazewell County Sheriff Edward Pratt, and their deputies. Then one day the gang made the fatal mistake of resisting the law once too often. The next few days would result in fatal gun fights, murder, aggravated assault, mob action, suicide, and a lynching that would make news nationwide. A classic piece of western frontier history right here in central Illinois! Here's a brief overview of the book, including a list of surnames and cities mentioned, and directions on how to get your own copy. One of the worst disasters in the history of United States inland navigation occurred at midnight, Friday, July 5, 1918 when the excursion steamboat Columbia, returning to Pekin from an excursion in Peoria, struck a sand bar and sank into the Illinois River near Wesley City (present day Creve Coeur) with 496 passengers (mostly from Pekin). Eighty-seven passengers, mostly women and children, drowned in the submerged wreckage. The rest lived to tell their stories of horror, bravery, and survival. After extensive research using the society's collection and other sources, TCGHS member Ken Zurski has written a gripping account entitled The Wreck of the Columbia - A Broken Boat, a Town’s Sorrow & the End of the Steamboat Era on the Illinois River - documenting the true story of the worst maritime accident in the history of the Illinois River. You can purchase a copy of this definitive book directly from Amazon. Read an excerpt.